Channel Crossing , by Sebastian Smith, Hamish Hamilton, 2001, 240pp. My friend Ed recommended this sailing book. When I was a child, my grandfather would leave by my bed stories like "Gypsy Moth" Circles the World and Sopranino . These are great reading, though I myself never sailed my sunfish outside the protected waters of Nantucket harbor. 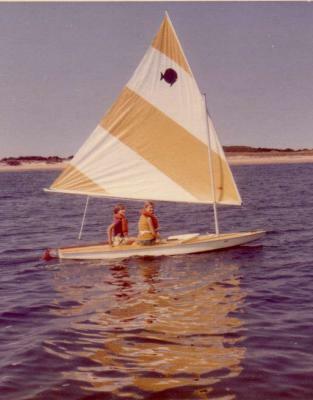 Likewise I only remember one time crossing the sound under sail with my grandfather -- the genoa jib was beautiful, and the silence of sailing, instead of using the motor, was wonderful. But by that time of his life Albert was happier just anchoring inside Coatue and having a picnic. I used to pester him about doing an Atlantic crossing, not that I personally liked the look of the waves outside the jetties, but the idea was certainly appealing in the abstract. Mr Smith gets the sailing bug young, when he goes to research an article on the last lighthouse keepers in England. Next thing he knows, he buys a 15' 10" Wayfarer dinghy and is sliding around the water slightly out of control. He wants to cross the Channel, but largely keeps his passion secret from everyone except his girlfriend, and even she is not invited along for the dangerous journey. It is charmingly youthful how Sebastian wants to become an expert sailor, but without actually taking lessons or enlisting anyone's help. I recently made a Channel crossing with Ross and my friend Dierk, in his Cessna, a first for me. (We had a fine time on Alderney). Dierk said that flying in England is generally more crowded and fraught than in the US (indeed, we had one exciting moment). From Sebastian Smith's book I got the same impression about sailing in the Solent and the Channel. The currents are treacherous, the shipping lanes are busy, and the weight of history lies heavy all around. Smith has swum the Hellespont, and briefly contemplated swimming the channel, though on one journalistic assignment he exchanged smiles with Fausta Marin Moreno, who then died on her swim. Some of this book's background facts are more interesting than others. The Goodwin Sands off Dover are worth knowing about. Shakespeare mentions them, they have wrecked over 2,000 ships, and Englishmen used to play cricket on them. Channel Crossing is by a normal, careful and thoughtful person. Of course, it is much more fun to read about lunatics. Amazon links led me to The Unlikely Voyage of Jack De Crow: A Mirror Odyssey from North Wales to the Black Sea , which I have purchased but not yet read. And further googling led to this blog, which makes Channel crossing sound easy! Scott wrote: This one sounds really good. Have you read about this woman who does extreme endurance swimming, like, mile swims in Antarctica? I don't recall her name, but she seems amazing. I replied: Yeah, I read about her (Lynne Cox) in the NYer. Pretty strange.